Before there were any divisions among the nations brought about by so many religions and belief systems, God in His infinite power always was. (Isaiah 45:11-12) Thus saith the Lord, the Holy One of Israel, and his Maker, Ask me of things to come concerning my sons, and concerning the work of my hands command ye me. I have made the earth, and created man upon it: I, even my hands, have stretched out the heavens, and all their host have I commanded….. (Genesis 1:26-28). There is no one nor anything that can be compared to God! His wisdom and strength is unsearchable (Psalm 145:1-3). We may think to be young our strength is greater…… but unless we wait upon the Lord even young men will fall as all strength is given us by the Lord God. (Isaiah 40:28-31). Hast thou not known? hast thou not heard, that the everlasting God, the Lord, the Creator of the ends of the earth, fainteth not, neither is weary? there is no searching of his understanding. 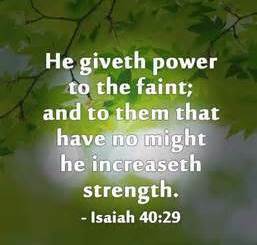 He giveth power to the faint; and to them that have no might he increaseth strength. Even the youths shall faint and be weary, and the young men shall utterly fall: But they that wait upon the Lord shall renew their strength; they shall mount up with wings as eagles; they shall run, and not be weary; and they shall walk, and not faint. When Philip asked Jesus to show who the Father is, Jesus reply was “He that hath seen me hath seen the Father” for He and His Father are one. Only God could have been made flesh to walk among man through His Son. (John 14:6-11) Jesus saith unto him, I am the way, the truth, and the life: no man cometh unto the Father, but by me. If ye had known me, ye should have known my Father also: and from henceforth ye know him, and have seen him. Philip saith unto him, Lord, show us the Father, and it sufficeth us. Jesus saith unto him, Have I been so long time with you, and yet hast thou not known me, Philip? he that hath seen me hath seen the Father; and how sayest thou then, Show us the Father? Believest thou not that I am in the Father, and the Father in me? the words that I speak unto you I speak not of myself: but the Father that dwelleth in me, he doeth the works. Believe me that I am in the Father, and the Father in me: or else believe me for the very works’ sake……. (John 10:30).